JNN 30 Jan 2014 Karachi : Pro-Taliban Saudi Stooge Jamaat-e-Islami leader Munawar Hassan openly commits Blasphemy By calling Osama bin Ladin as ‘Syead us-Shuhada’. Muslims in General, while Shiite Muslims in Particular across Paksitan have condemned his aggression and have shown their anger over JI leader Munawar Hassan statement , by giving title of ‘Sayyid al-Shuhada’ to a world’s top most terrorist “ Osama bin Leadin ”. The title ‘Sayyid al-Shuhada’ which is the Only Prerogative of Hazrat Imam Hussain a.s, the grandson of Prophet Muhammad (P.B.U.H) , as it was Honored to him by Holy Prophet himself , and altering the statement and title given by him is deeply condemnable and is Blasphemous . The Shia Religious Leaders and Common People have demanded and Inquiry into such Anti Islamic acts of Inciting Hatred , and it should be brought to the Islamic Ideological Council and to issue their official statement , endorsed by the Religious leaders of all sects to give their Opinion on such Blasphemous comments . As now in his love for the Saudi Monarchy he is ready to Become Yazeed . The title of “ Syed Us Shuhuda ” was Honored to Our 2nd Imam Hazrat Hussain as. By Our Last Holy Prophet Muhammad PBUH , in recognition to his sacrifices rendered in the Love for Islam , and to save Islam from being altered and Mis Led by Yazeed ,and His Companions .Imam Hussain a.s is a Person of High Repute and even the Non Muslims commend him with High esteem and Honor , as his act of Not Bowing to the Pressure by the Ruler of his Era Yazeed Ibn e Mauvia , and for which he has to Pay the Price ,in shape of sacrifice of his Family and Friends in the Battle of Karbala, where He refused to Pledge Yazeed’d Pledge of Allegiance , and stood fast , with his Only 72 Family Members and Friends , confronting an army of 30,000 . Jamaat-e-Islami Pakistan however has said the statement of their chief reflects his personal view and it is not their official party stand. 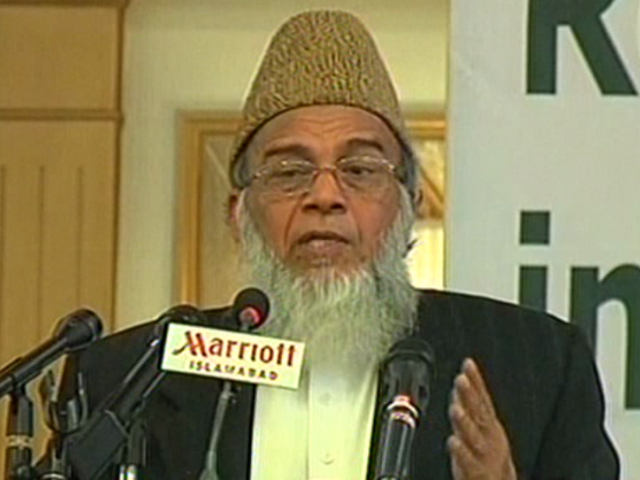 Munawar Hassan has been habitual to issue statements against Pakistan army, government and Shiite Islam. This entry was posted in Asia Pacific, Pakistan News and tagged Ameer Munawar Hassan, Blasphemy, Jamaat e Islami, JI. Bookmark the permalink. IN THIS WAY EVERY PIG WHICH IS KILLED WILL BE CALLED MARTYR , WHAT A FUNNY MAN THIS MULLAH IS . EVERY CHILD OF THE WORLD KNOWS THAT THE MAN WHO DIDNT GET EVEN A BURIAL AND WHO WAS MADE THE FEED OF WILD SEA ANIMALS WAS THE PIONEER TERRIRIST CRIMINAL WHICH REALLY SULLIED THE NAME OF ISLAM WHICJ SINCE OSAMAH BIN LADEN HAS BECOME SYNOMINOUS WITH TERRORISM. TERRORISM IS SUCH A TERRIBLE CRIME ITS HAS BEEN VERY CLEARLY IDENTIFIED IN THE QORAAN AND THE TERRORISTS WHO HAVE BEEN NAMED MOHARIB HAS BEEN ASSIGNED THEIR PROPER PUNISHMENT . OF COURSE THERE HAVE BEEN TERRORISM SINCE TIME IMMEMORIAL AND IN ISLAMIC HISTORY THE GREAT MUNAFIQ WHO WITH HIS THUGS AND BURNING TORCHES WAS SENT BY THE FIRST USURPER OF PROPHET OF ISLAAM’S SUCCESSOR’S KHILAFAT . CURIOUSLY THE SUCCESSOR OF OBL CARRIES THE SAME NAME.IS IT NOT SURPRISING THAT THE WORST ZALIMOON OF IRAQ AND THIS MULLAH BOTH BEAR THE MOST SACRED NAME OF FARZAND E RASOOL (saaws) . HELL WILL NOT SEE THE NAME BUT THEIR AS IN HINDI IT IS CALLED KU-KARM . TODAY EVEN A STRAY DOG GETS BURIED AND THIS CRIMINAL COULD HAVE BEEN VERY EASILY PRESSED UNDER SOME SAND BUT NO WAS CONSIDERED TO A GOURMET FOR THE WILD CREATURES OF THE SEA AND MUST BE BAKING HIS BREAD WITH THE ILLEGITIMATE SON OF HATTAB .